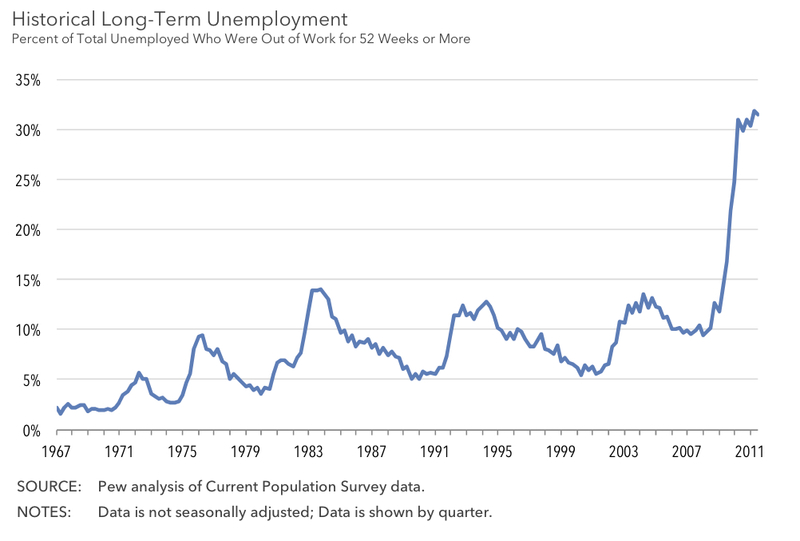 Between the third quarter of 2009 (when the recovery is said to have begun) and the third quarter of this year, the percentage of workers who had been jobless for a year or longer nearly doubled from 16 percent to 31.8 percent. The number of workers who have been unemployed for a year or longer has jumped, during the same period, from 2.5 million to 4.4 million. One should also factor in the consideration that being unemployed today is dramatically more life threatening (in so many ways…) then it was in the late 60s. Aside from cash economies and electronic tracking, the government “brokerage” control over people’s survival strategies has intensified and the capital intensive service sector has grown so path dependent that losing your job has extended liabilities that reach into membership identity itself. This frightful chart has implications that are far reaching for society; perhaps more than any time in history. There simply is no coherent safety net in community or extended family connectivity. The market has become a sink or swim ocean, and for some that will be an ocean of irreconcilable (and irrecoverable) loss and despair. This in an environment where social service and medical psychological support is threatened by the class structured template of austerity policies. The way to deal with structural long term unemployment is to institute a basic guaranteed income for all, a financial floor that has no cracks in it. This will also help create a steady minimum cash flow in the economy which benefits everybody. And where are you going to get all that money from? The problem is not where you get the money from: you [at the moment the banks] print it simply by authorising credit. The problem is to prevent it disappearing into the black hole of stock exchange speculation, gambling, fraud and commissions. Casting people on the scrap heap is a certain way to generate massive social problems and finally armed rebellion. There are way far too many people for the number of “normal” jobs available.Immigration must cease and natural increase curtailed.The export of jobs through the globalization greed machine has to be stopped and the process reversed. Meanwhile,a relable and adequate income guarantee as a safety net is absolutely necessary.A job guarantee scheme which employs surplus labour on public works at a basic living wage is needed to give the cast offs a sense that they are a necessary and valuable part of the community.Alienation is the mortal enemy of the individual and society. First point agreed. Second point: nonsense! Export/import of people, jobs, machinery and resources can be controlled, the necessary work can be shared instead of being done by a few overworked slaves, and the population – starting with politicians and educators – can be sent back to school to learn how PID control systems work so they can set up and teach people how to use the information feedback arrangements necessary for people to be able to see the need for and how to coordinate and control their communal child-bearing. Third point (a) a reliable and [more than] adequate income guarantee: absolutely! (b) a job guarantee on public works for cast-off labour at a basic income? Hold on a minute. Who is counting who as the cast-offs? I suggest we cast off all those sods renting out and gambling with pubic money in the banks and stock market casinos and let them do public service for a pittance. What is sauce for the goose is sauce for the gander. “The population – starting with politicians and educators – can be sent back to school to learn how PID control systems work, so they can set up and learn how to use information feeedback arrangements letting them see the need for and how to control their communal child-bearing”. It seems to me, having practiced the science of control, that knowing one’s town’s population target, death rate and pregnancies already intended in the current year, are the key pieces of information necessary for communally responsible family planning. Our “authorities” -still trained, Podargus, in the classical tradition of “carrot and stick” – are not yet seeing the need to make them publicly available. or shortfall ted (so mathematically Integrated) or changed (Differentiated) in light of changing opportunities.